The trial witness, Nkem Ahidjo, told the court yesterday that himself and Atewe met in Abuja some years ago where they worshipped at the Aso villa church. He said he built a strong relationship with Atewe and even attended night vigils in the former military general's home in Abuja. He said when he started receiving the alerts, he told Atewe who asked him to hold on to the money unti further instructions. Atewe left for Abuja and invited Ahidjo over. 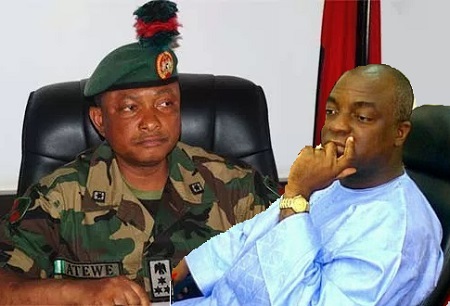 The witness said the military chief then introduced him to one who was receiving the money on Atewe's behalf. Due to the bulk of the money, Ahidjo said he was instructed to convert the money to dollars for esy transportation.